When I first moved to Austin in 2006, bestie and I used to go out with our friends to the lake and hang out on their boats a good bit. It was good times. But I probably haven’t been out on a boat at the lake since 2007. Sad, right? Well, today J and I will be going and doing just that!! He has one of those big ol’ tubes so that should be…interesting, to say the least. But I’m definitely excited and looking forward to it. Then afterwards we’ll probably go back and grill some good food to replenish all the calories we burned being dragged around the lake and holding on for dear life. Of course burgers are a grilling classic, but how fun is it to grill up a burger and then top it with some kicked up, spicy toppings? Super fun! 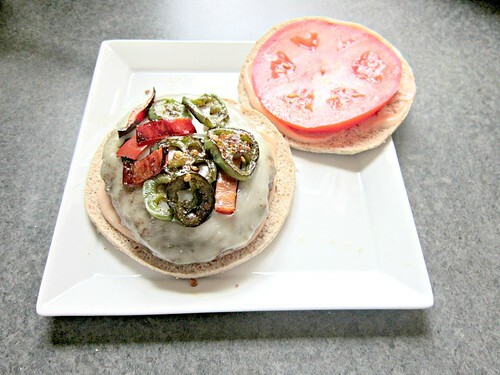 J and I love spicy food, that’s no secret so adding grilled or sauteed peppers and a spicy ranch sauce to a burger is pretty much perfect for us. Spicy sauce, spicy peppers, creamy cheese, and a cool slice of tomato. Yep, that’s a perfectly delicious burger right there!!! And the sauce is good to dip sweet potato fries in, too! Maybe being dragged behind a boat on an inflated tube isn’t your cup o’ tea, but you can live a little adventurously with these spicy, firecracker burgers!! In a large bowl, combine the ground beef and Worcestershire sauce. Form into 3 evenly-sized patties and season with salt and pepper. Heat a skillet or grill pan (or your outside grill) over medium-high heat and spray with cooking spray. Cook 4-5 minutes on each side, or until your desired level of doneness is reached, topping with a slice of cheese for the last minute of cooking. In a small bowl, combine the chipotle adobo sauce and ranch dressing. Stir to mix well, taste and adjust if needed (add more chipotle or more ranch). 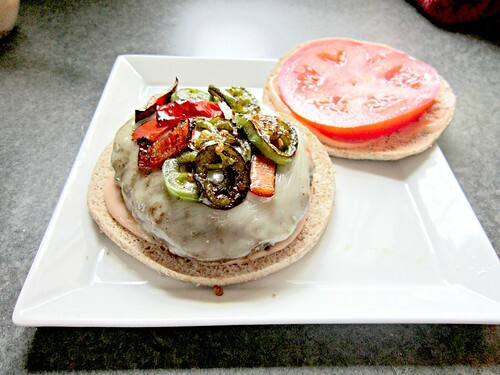 To assemble the burgers, toast your burger buns if you like them that way, slather on a generous helping of the chipotle ranch (I put some on top and bottom buns), the top with a burger patty, a spoonful of the sauteed peppers, tomato slice, and top bun. Serve with your favorite side (we had chipotle sweet potato fries) and enjoy!